Wonderful Afternoon Time in Fuji-Q! With Unlimited Rides, The More You Ride, The More You Save ! This is the Ticket which unlimited pass of all attraction (only Super Scary Labyrinth of Fear is excluded) in Fuji-Q highland and Thomas land. Not only roller coasters, the park also features a variety of attractions and events based on popular anime and game characters such as Gaspard and Lisa, Thomas the Tank Engine and Evangelion, and ice-skating rink. This is afternoon pass ticket. Step1 Get the afternoon pass ticket QR code. Step2 Redeem afternoon pass ticket at ticket machine from 13:00. Step3 Facial regulation and entry the park. ・You can purchase it from a personal computer, smartphone or tablet. Step4. Choice your payment term. Step5. Enter your e-mail and find QR code in your mail. Step7. Check your QR code. ・Cancellation is not be allowed after purchasing. ・Afternoon pass QR code ticket is only valid for 30 days. ・Super Scary labyrinth of Fear is NOT include. ・Cancellation, modification and refund is not be allowed after purchasing. events may change due to weather conditions, seasons and other circumstances without prior notice, tickets are not refundable, exchangeable in any of these cases. ・The ticket is NOT for resale. ・The ticket is effective from 13:00.
including frequently arriving trains and buses. Get started with the Fujikyu Corporate Site or contact Bus Center at (0555-73-8181) to find your most convenient way of transportation. at Otsuki Junction, and get off at Kawaguchiko I.C. (app 50 min). 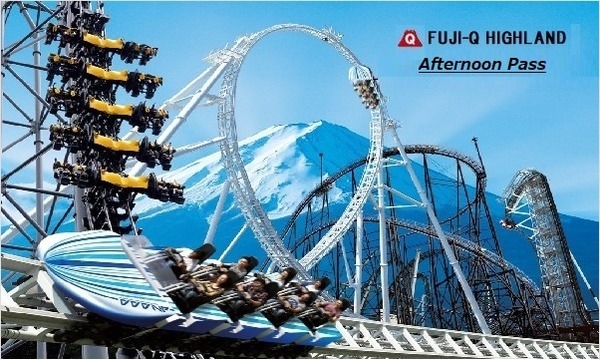 Fuji-Q Highland will be less than a minute away from Kawaguchiko I.C..